The City of Los Angeles last month voted to increase its minimum wage to $15 by 2020. Now the County Board of Supervisors is being asked to raise the minimum wage in the unincorporated areas of the County, the only area over which we have jurisdiction. After reading all the reports and digesting all of the constituent calls and letters, I want to share my thoughts on this issue. Our starting point is the fact that poverty is alive and well amidst the abundance of our regional economy. Los Angeles County has a larger GDP than the countries of Belgium, Saudi Arabia, Norway and Taiwan. Yet, nearly 30 percent of Los Angeles County residents live in poverty, defined by the Stanford University/Public Policy Institute of California as $30,000 annual income for a family of four. That’s a city the size of Chicago made up of only men and women living in poverty, right here in our County. Nobody supports poverty. Whether one supports or opposes a minimum wage increase, I suspect that most people believe that anyone who works full-time should earn enough to provide for their family. At the same time, it is also clear to me that increasing the minimum wage poses a real and significant challenge to many businesses, especially the small mom-and-pop businesses that make up the majority of these enterprises. Here’s what made the difference for me. As you know, the County serves as the safety net of last resort for Los Angelenos. It may surprise you to learn that the County government provides many safety net services to people who hold a job. The more I thought about this, the more I realized that this means that the County is, in effect, subsidizing these businesses by providing the services that these workers need to survive. Taxpayers subsidize every dollar of profit earned by a business owner employing workers who rely on County services. In fact, a 2015 report by UCLA and the Economic Roundtable, estimated that raising the minimum wage could reduce public assistance expenditures by more than $300 million per year. It may be the case that subsidizing businesses with taxpayer money is the best way to combat poverty. I don’t think so. After reading so many reports on the issue, I have come to believe that raising the minimum wage not only fights poverty but also benefits our economy as a whole. I think that most low-wage workers will immediately spend their increased income by buying goods and services to meet their families’ basic needs. They will purchase these goods and services from local businesses, stimulating our local economy. Another issue that gave me pause is that an economy does not obey municipal boundaries. Your customers are the same whether your business is on the unincorporated or incorporated side of the street. I don’t think it makes sense for business owners to decide where to locate based on anything other than where they think their customers live or shop. I wish that the federal and state governments were acting quickly or aggressively enough to raise wages. But they are not, and local governments throughout the Country have stepped up to the plate. Since the City has taken action, so must we. Combined, the City and the unincorporated areas would cover more than 50 percent of the more than 10 million County residents. A move by the County will also encourage more and more of the County’s other 87 cities to follow suit. Such collaboration would reduce the potential friction and competition between neighboring municipal jurisdictions. The result: a seamless, Countywide minimum wage resulting in a more stable and prosperous regional economy. But we also need to make sure that raising the wage won’t kill jobs and disproportionately impact small businesses. That’s why the County must also act to support small businesses as they make this transition. I will introduce a motion for Tuesday that directs the County departments to move forward aggressively on a set of recommendations to support small businesses during this transition. This is a hard issue and an important decision. But in the end, we have to acknowledge that something must be done to combat the rising inequality that is weakening our society. Ensuring that anyone who works full time can support their family is a solid step in that direction. Hilda L. Solis is a member of the Los Angeles County Board of Supervisors. She served as the 25th United States Secretary of Labor from 2009 to 2013. City of Los Angeles transportation officials are conducting a “thorough line by line analysis” of city bus services to determine what the city’s Commuter Express, DASH and Cityride Services should look like in the future. The analysis process will include public meetings, workshops and an online survey, according to the Los Angeles Department of Transportation (LADOT). L.A.’s diverse residents have diverse transportation needs, says LADOT, explaining that transportation needs along with the rise of new residential pockets and commercial corridors are already changing how people use public transportation. Input received from residents during the analysis period will help shape such things as where new transit routes should be located and answer questions about whether or not the current system is meeting residents needs, the agency said. The information will also be used to evaluate the efficiency and cost-effectiveness of the city’s Commuter Express and DASH, along with strategies to increase ridership and revenue for the transportation systems. Two public meetings have already been held; the remaining four are scheduled to take place between June 15, 16 in downtown Los Angeles, South L.A., San Pedro, and on June 17 at Ramona Hall in Northeast L.A, from 6-7p.m..
For more details on times, dates and meeting locations, go to http://www.ladottransit.com. Mayor Eric Garcetti said in his State of the City speech Tuesday that his “back to basics” approach has yielded results and announced a series of measures to tackle a recent rise in violent crime. “City Hall is getting things done, neighborhoods are on the move, people are getting back to work,’’ Garcetti said at in the Valley Performance Arts Center at Cal State Northridge. But since then, new jobs in city have been added at “the fastest pace in more than a decade” and the city’s credit rating is up, he said. “Los Angeles and your City Hall are roaring back, and the state of our city is strong,” Garcetti said. Garcetti acknowledged that there is more work ahead with the city recently experiencing a rise in violent crime. Garcetti said he will extend the city’s Summer Night Lights program – which keeps parks open later during summer as a way to steer youth away from gangs – so parks will also remain open late on Friday nights during the school year. The expansion includes creating a team of 40 officers who will take this “relationship-based” approach to policing. Garcetti added that he will make a budget proposal next week to increase funding for the city’s Gang Reduction and Youth Development program by $5.5 million. Garcetti also announced that the city will allow ride-share companies such as Uber and Lyft to join taxi companies in being able to pick up passengers at airports beginning this summer. Garcetti also said the city will now also provide data to Waze, a smartphone app that gives crowd-sourced traffic directions. The app will now be able to show areas where the city have closed streets for repairs and even film shoots. In a speech that touched on numerous initiatives and ongoing issues in the city, Garcetti avoided discussing ongoing labor talks with city employees – thousands of whom recently voted to authorize a strike as contract talks stall. Garcetti said last year that in order to eliminate future budget deficits, the city needs to hold the line on city employee wages and get workers to agree to contribute a higher percentage of their health care costs. City employee unions have so far resisted such concessions. Garcetti used the speech as an opportunity to remind the public about the continuing drought and his plan to prepare the city’s infrastructure and buildings for the next big earthquake. “We’ll get through this drought because we are a resilient city … a city that prepares for disasters, instead of being caught off guard,” Garcetti said. The drought, now in its fourth year, has become a pressing issue across the state, with Gov. Jerry Brown calling for a 25 percent reduction in water use, and the Metropolitan Water District of Southern California expected to restrict water deliveries to its members agencies by 15 percent — only the third time in 25 years it has enacted such limits. Garcetti, who noted that Cal State Northridge where he is delivering his speech was damaged in the 1994 Northridge earthquake, said the college bounced back quickly, re-opening a month after the temblor. The plan calls for strengthening the city’s water delivery system, improving the local communications network and requiring that buildings prone to collapsing during earthquakes be retrofitted. Garcetti also used the speech to tout several major proposals he has put forth in recent months. The City Council will debate his proposal – announced on Labor Day – to raise the minimum wage to $13.25 per hour by 2017. Some city leaders want to go further and boost the wage to $15.25 by 2019. UC Berkeley’s study of a proposal to raise the minimum wage in Los Angeles is expected to be released this week, ahead of four public hearings on the issue being hosted over the next month by a City Council committee. The study was commissioned by the city to look into the economic effects of raising the minimum wage from $9 an hour to $13.25 an hour by 2017, to $15.25 an hour by 2019, and higher in subsequent years based on the Consumer Price Index. Separate studies have been commissioned by the Los Angeles Area Chamber of Commerce, representing the local business community, and the Los Angeles County Federation of Labor, AFL-CIO, which represents unions. Berkeley’s Institute for Research on Labor and Employment also prepared the study for Seattle’s minimum wage hike plan, and worked on a economic study that Mayor Eric Garcetti released last September as he announced his proposal for raising the wage to $13.25 per hour. Some business leaders opposing the wage hike plan – which they argue could lead to layoffs of workers or increase costs for products and services – have criticized the choice of UC Berkeley as the economic research firm for the proposal. But some business groups say they are in support of the minimum wage hike plan, with Garcetti recently touting the Los Angeles Business Council’s endorsement. – 6 p.m. April 2 at the Museum of Tolerance, 9786 W. Pico Blvd. Having shunned a chance to run for U.S. Senate, Mayor Eric Garcetti has quietly filed paperwork to seek re-election in 2017. Garcetti filed re-election paperwork on Monday with the city Ethics Commission, according to the panel’s website. The filing allows him to begin fundraising for the campaign. He has also been mentioned as a likely candidate for governor to replace Jerry Brown, but Garcetti has not given any indication that he is considering such a bid. The Los Angeles Times also noted that Garcetti had launched a “bare-bones” campaign website at www.ericgarcetti.com. The site contains a biography of Garcetti and a link to make donations. 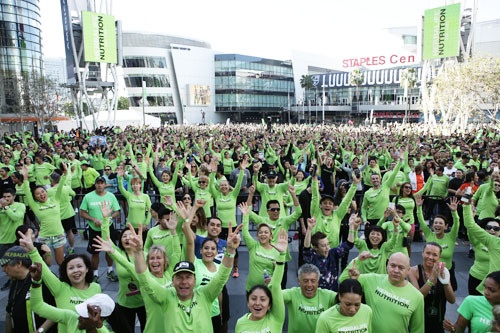 A sea of green-shirt clad exercise enthusiasts descended on Downtown Los Angeles last weekend to set a new Guinness World Record for the largest number of people exercising at the same. The record-making challenge was spearheaded by global nutrition company Herbalife. Tens of thousands of Herbalife members and their customers – in 80 different countries, including Mexico, New Zealand, Japan, Russia, Spain, Italy as well as the U.S. – took part in the challenge to set the new record for the most participants in a “High Intensity Interval Training Workout in 24 Hours,” the company said in statement Tuesday. Locally, the event provided a double record whammy, with nearly 4,000 people exercising at one location, the LA Live Nokia Plaza in Downtown L.A.
“It was great to be there in person to see so many excited and enthusiastic people all working out together. I was delighted to be able to confirm the record had been set and personally present the certificate to the company,” said Guinness World Records adjudicator Michael Empric, who attended the event in L.A. The record challenge kicked-off Saturday, March 7 at 9 a.m. local time in Auckland, New Zealand, and for the next 24-hours, workout events were held across the globe, culminating at Herbalfe’s LA Live offices. The event also helped raise funds for Herbalife Family Foundation’s “health and nutrition programs around the world for at-risk and low-income children in underserved areas of the world,” according to the company’s announcement. City Councilman Jose Huizar fended off a spirited challenge from former Los Angeles County Supervisor Gloria Molina to retain his 14th District seat, headlining a winning night for council incumbents. “We did it!” Huizar shouted at his election-night party Tuesday night at Salesian High School, drawing cheers from the crowd. Huizar’s battle with Molina – billed a heavyweight bout between two Eastside political veterans – turned out to be a largely one-sided affair. Huizar grabbed a commanding lead when vote-by-mail ballots were tallied, and he never looked back. As a former county supervisor, city councilwoman and assemblywoman, Molina was the best known of the four challengers attempting to unseat Huizar, who will return for his third and final term representing the district that stretches from downtown Los Angeles to Eagle Rock. Huizar — whose most recent term was marred by sexual harassment allegations — insisted the 14th District has seen improvements thanks to his efforts to secure funding for graffiti removal, repair work on a City Hall building in Eagle Rock, initiatives to help the homeless and other programs to address local needs. “Last night’s results are a testament to the great work that we have accomplished together over the last 9 years,” Huizar said in a statement posted Wednesday on his campaign’s facebook page. “We move forward with a commitment to prioritize basic services in the city budget and improve their systematic and procedural delivery,” his post said. In the eastern San Fernando Valley’s 6th District, incumbent Nury Martinez emerged victorious in a rematch with former Assemblywoman Cindy Montanez. Montanez was the top vote-getter in the 2013 primary election to complete Tony Cardenas’ unexpired term, but she lost to Martinez in an upset in the runoff election. Martinez said during her more than 18 months on the job, she has fought prostitution and human trafficking crimes, brought in economic opportunities and jobs, and worked to clear up blight. Herb Wesson, who represents the 10th Council District, cruised to victory over Koreatown activist Grace Yoo, who last clashed with the powerful council president during contentious proceedings to redraw district lines in the Koreatown area. Councilman Paul Krekorian also held onto his early lead in his bid for a second term representing the 2nd District — which includes North Hollywood, Studio City, Valley Village and Van Nuys, against challenger Eric Preven, a television writer who is a regular gadfly at City Council and County Board of Supervisor meetings. Councilman Mitch Englander ran unopposed in the 12th District, which includes Reseda, North Hills, Northridge, Chatsworth and Porter Ranch. In the 8th District, Marqueece Harris-Dawson, a former executive director of a nonprofit founded by Rep. Karen Bass to improve economic conditions in South Los Angeles communities, defeated three other candidates to replace termed-out Councilman Bernard Parks. The race to replace termed-out Tom LaBonge in the 4th District will move to a May 19 runoff election, with 14 candidates splitting the vote and preventing any candidate from earning the more than 50 percent needed to win the seat outright. The council members elected today will serve 5 1/2-year terms. The passage of Charter Amendment 1 will mean a one-time lengthening of the terms of city and school board officials elected in the 2015 and 2017 elections, with future elections being held in even-numbered years. Even as city workers rallied at job sites around the city to protest what they call cuts to municipal services, Mayor Eric Garcetti insisted Tuesday there has been recent progress in labor negotiations with employee unions. “I feel we’ve made great progress last week at the table. There’s been real progress on substantive issues, and we’re going to continue there,” Garcetti told City News Service. Garcetti and other city leaders have said they are seeking no raises, increased employee contributions to health-care costs and other concessions from the coalition of city employee unions, whose labor agreements expired in July. “We still have a long ways to go, but … it’s not at a standstill, which it was for a long time. There’s actual movement now,” he said. Garcetti’s comments came as Fix L.A., a group affiliated with the unions, is organizing protests with workers at more than 60 job sites. Picketers, some waving giant Band-aids or wearing outfits festooned with trash at the City Sanitation Yard and the Dockweiler Beach Youth Center, alleged that the city has failed to adequately maintain city sanitation trucks, which could break down and become a public safety threat. They also contended that bad Wall Street deals have leached money from city coffers that could have been used to clean up storm drains. “We have a strong message that we want the city to not pay the bank, to put that money back into the community, the residents of Los Angeles, and we hope the mayor will work with us on that,” wastewater sanitation worker Simboa Right told City News Service. Protesters also picketed at the Los Angeles Zoo, Los Angeles International Airport, Department of Transportation building and Public Works offices to express their dissatisfaction with city leaders.